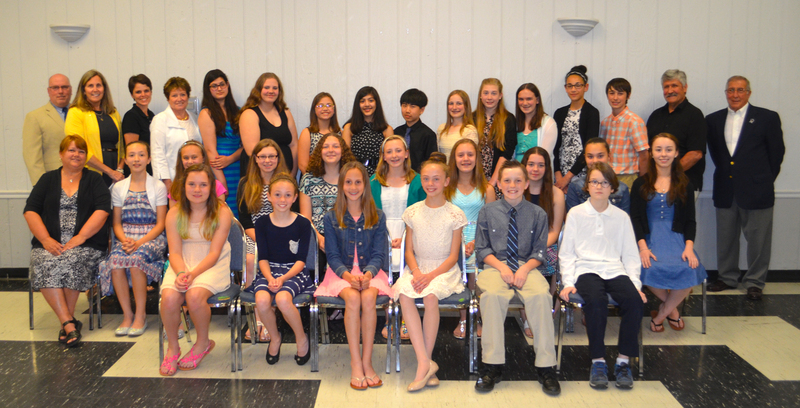 The Oswego Middle School Top 50 Dinner was held at the Oswego Elks Club recently, a celebration of academic success for seventh and eighth grade students. Parents, families, friends, teachers, administrators and board of education members were on hand to recognize these students’ efforts in the classroom. The Oswego Sunrise Rotary Club, Pathfinder Bank and the Oswego City School District partnered on this special event for the OMS academic leaders. First row – Nicole Anthony, Sophia DeLorezo, Katie Fierro, Molly Fitzgibbons, Jake Chetney, and Liam Brown. 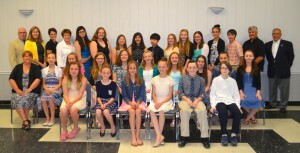 Second row – Rotary Club president Kathy Duncan, Megan Albright, Kirsten Bell, Marissa Bell, Elizabeth Bush, Grayson Cary, Julia Roman, Kaitlyn Czerow, Nicole DelConte, and Alexandria Delfino. Third row – assistant superintendent Dr. Dean Goewey, OMS Principal Mary Beth Fierro, board of education member Heather DelConte, board of education vice president Lynda Sereno, Abigail Faul, Hailey Furlong, Grace Hoffman, Ruhma Khawaja, Colin Li, Abigail McPherson, Ashley Patterson, Rielly Rozyczko, Victoria Tripp, Owen Warner, board of education members Sam Tripp and Tom DeCastro. 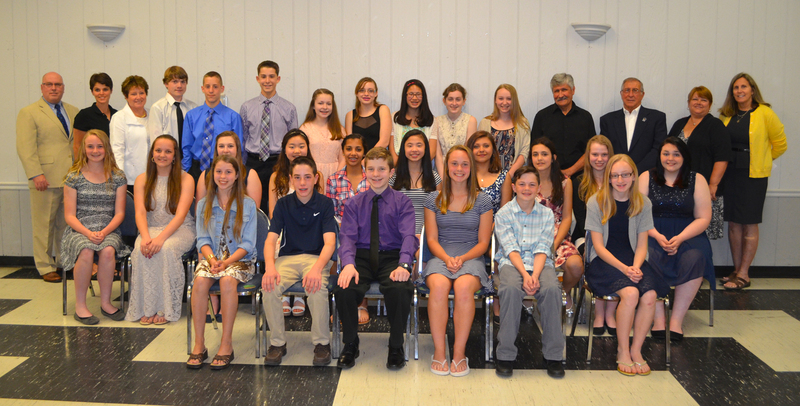 First row – Alyssa Adner, Anthony DiBlasi, Nicholas Brown, Joan Carroll, Logan Shepardson, and Mikayla Hardesty. Second row – Lauren Devinny, Jenna Bradshaw, Jillian Dowdle, Melissa Chun, Lara Kanbur, Willow-Su Knapp, Alyssa Lee, Sofia Loayza, Elizabeth Martin, and Liberty McCracken. Third row – assistant superintendent Dr. Dean Goewey, board member Heather DelConte, board vice president Lynda Sereno, Dakota Contryman, Derek Morgia, Dane Richardson, Allison Choate, Tessa Smith, Sydney-Yu Terpening, Sophia Throop, Halle Wells, board members Sam Tripp and Tom DeCastro, Rotary Club president Kathy Duncan, and OMS Principal Mary Beth Fierro. Absent from photo was Sofia Proano.